Join the artists of the Fifth Avenue Art Gallery as we display our visions of a Florida winter. Migratory birds visit by the thousands and local birds don their breeding plumage. Sea grapes splash beach dunes with vibrant color and northern visitors enjoy wearing shorts, swimming, and surfing. Ripening citrus, colorful blooms, and breathtaking sunsets are offered in abundance. A Florida winter is relaxing and the paintings will give you the opportunity to take that piece of Florida home with you. The celebration begins on First Friday, February 6, 2015, from 5:30 to 8:30 p.m! 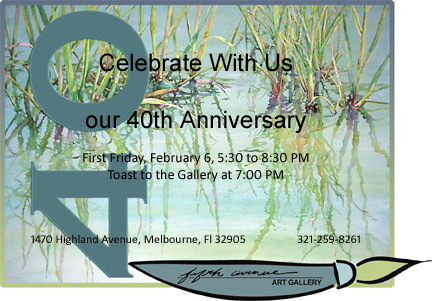 A champagne toast at 7:00 PM will mark the beginning of the Fortieth Anniversary Celebration at the Fifth Avenue Art Gallery, 1470 Highland Avenue. The celebration begins on First Friday, February 6, 2015, from 5:30 to 8:30 p.m. Past and present members will be honored by a video presentation featuring paintings and photos from the gallery’s history starting in 1975 when the gallery first opened. An Honor List of the 118 past and present gallery members and a collage of photos from the past 40 years will highlight the display. Mayor Kathy Meehan from the City of Melbourne will be participating in the celebration. The public is invited. The Fifth Avenue Art Gallery, the oldest in Brevard County, set a high standard from the beginning for artwork that would be shown in the gallery. That standard has been maintained to the present. The gallery has provided a museum-like setting for the finest local artists, some nationally and internationally recognized, to display their work. It is “the place to go” for original artwork and the finest crafts. The gallery is excited to welcome our past member Melissa Hall for our March Front Room Gallery exhibition. The past few years have seen a fundamental shift in the way I approach my photography. When I originally began working with my camera, I shot a multitude of images that would later be combined into a single composition. Textures inspired me. Getting that elusive story into one shot was not a comfortable idea. Returning to Kentucky after 10 years of living in Florida, altered not only my environment but also my muse. Shooting wonderful but dilapidated houses opened my eyes to new ways to tell a story. These decaying spaces sparked my imagination and allowed me to start working conceptually. I began to see the potential in my new environment and wanted to build narratives in these wonderful spaces. I have branched out to incorporate a variety of locations, even including underwater photography. Muses & Sirens presents a collection of work which celebrates what can happen when you listen to that siren call of finding that next location, the perfect dress, and the wild women who inhabit my work. We talked with Damien about his art at his well-known exhibit spot on A1A. He is there every Sunday morning with original works and prints, painting and talking with buyers who own many pieces and are looking for more. How did it all start? With a look at original work by Norman Rockwell in his formative years, he recognized that being an artist meant having a job and supporting a family with lots of hard work and flexibility. He went for the brass ring and never lost sight of the prize. Art fits his life style of healthy living, surfing when the waves are performing, and being present for parenting activities. “I like to think that art is not about competing but cooperating with fellow artists.” You will not find opportunities to buy his work anywhere other than Brevard County. He works exclusively in acrylics, which gives the work a bold look and every piece ties him to water, be it ocean or the Lagoon. Prepare yourself for an exciting show and an opportunity to chat up an authentic ‘surfer artist’. Damien will give a demonstration of his techniques on Saturday, April 11th at 2:00. Award-winning Orlando artist Mindy Z. Colton, originally from New York City, was classically trained in all the traditional arts. She pursued a career in Graphic Design & illustration, eventually leaving behind her successful career to follow her true passion as a fine artist. Her focus in recent years has been sculpture. She is known for her unique sculptural horses and large outdoor art. Mindy graduated with honors from the High School of Music & Art, NYC. She attended the prestigious Parson’s School of Design, and also studied at the Art Student’s League of New York. Mindy earned a B.F.A. from Washington University in St. Louis School of Fine Art. She has pursued advanced sculpture experiences attending workshops in Colorado and Arizona. Mindy’s fine art–including sculptures, paintings, mixed media, and photography, have been exhibited in numerous solo and two-person shows, and more than 150 juried and group shows garnering over 100 awards. Mindy has exhibited and garnered awards in both two dimensional and three dimensional mediums. Her sculptures have been exhibited at the Epcot International Flower & Garden Festival Invitational Sculpture exhibit, the Boca Raton Museum of Art, The International Museum of Art El Paso, TX. The Museum of Art, Deland, The Elliott Museum of Art, Stuart, Louisiana State University “Animals in Art” International Exhibit, the McKee Botanical & Sculpture Gardens, Marco Island Artquest, Atlantic Center for the Arts at Harris House, Brevard County Arts in Public Places Outdoor Exhibit, the 2013 Polk Museum of Art Outdoor Sculpture Exhibit, Washington State Thoroughbred Foundation and Breeders International Exhibit, Auburn, WA, Leepa Rattner Museum of Art, Tarpon Springs, Museum of Arts & Sciences, Daytona, St. Augustine Art Association, Northern Westchester Cultural Arts Center Equine Invitational, Harness Tracks of America Art Show & Auction, Lexington, KY, Mount Dora Center for the Arts , South Florida State College, Fifth Avenue Art Gallery of course and many others. Mindy’s art is in private and public collections across America, Canada, Europe, Russia and the Caribbean. My life-long love of and involvement with horses drives my passion to create equine themed art. Horses are beautiful animals, full of spirit, energy and truth. My horse sculptures are unique figurative abstractions with a decidedly expressionistic aesthetic. I use the horse to elicit a feeling or mood, or to create a story. I sculpt one-of-a-kind and limited edition sculptures in clay, mixed media, bronze, aluminum, and other permanent media. With my unique mixed-media sculptures, I can indulge my artistic passion to work in three dimensions, sculpting, carving, shaping, and painting. The long striding legs of my larger horse sculptures are carved tree limbs, mane and tail copper jewelers wires, maps, vines, shells and other materials, and the textured body carved from various permanent media. My ceramic mixed-media horses have solid steel rods embedded in them, and are unbreakable. They are Bisque fired, and each one is individually finished and totally unique. I strive for my works to intrigue the viewer, invite a closer look, and exhibit strength, determination and vulnerability. Please join us at 2:00 on Saturday, May 9th for artist talk with Mindy. The Fifth Avenue Art Gallery is pleased to announce that Nancy Seib’s exhibit, Symbols and Sighs, will run from June 2nd through June 27th. Nancy was the 2014 Winner of our 100% Pure Florida competition. She received her MFA from the University of Chicago and came to Brevard to teach at BCC which is now Eastern Florida State College. Nancy’s art reflects the varied disciplines she has taught, combining styles and media, but always with a little philosophic edge. 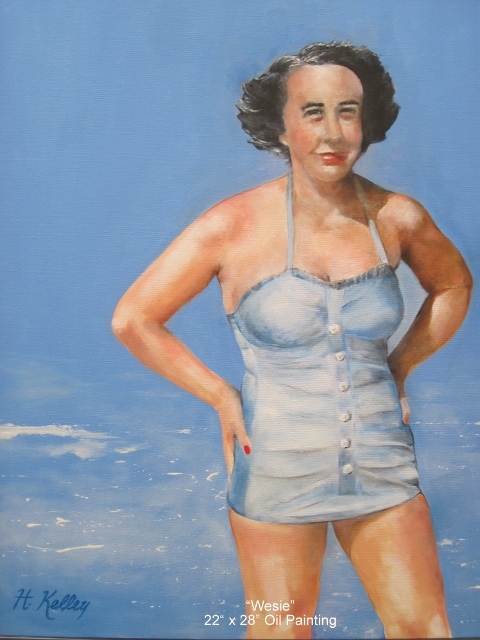 Nancy is a member of the Ten Women in Art and has exhibited in numerous locations with them. Over the years, she has been selected to exhibit in many juried shows, both national and international. Her photographic assemblage “Windows” is in the permanent collection of the Foosaner Art Museum. Using her art, Nancy continues to explore what she understands of the world. She, however, expresses these things with a little irony and humor. Nancy will give an “Artist Walk” through her show on Saturday, June 13th at 2:00. Free. Open to the public. Seating is limited. 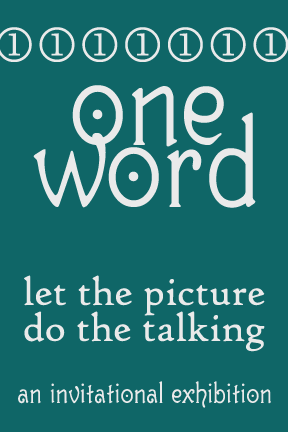 We all know that “a picture is worth … a thousand words”, but what happens when you ask artists to use their talents to express “one word“. Each of the participating artists will receive a three word list from which to pick their “one word” , then use their creativity to express that word. This very important, one word will be the title of their creation. The interactive part of the exhibit happens, when you the viewer try to match the artwork to the correct title. It may not be as easy as it sounds. All artwork titles will be hidden from view until you’ve made your matches. Each August the gallery members offer original unframed art, discounted art reproductions, art supplies and more. Don’t miss this opportunity to collect some “treasures” from some of the area’s best artists! Heather is a member of The Fifth Avenue Art Gallery. She grew up in Orlando and, with private art instruction from local artists, has been painting since age 10. Her art degree is from The University of Florida, with graduate work at Georgia State University in Atlanta, Georgia. She resides in Melbourne Beach, Florida. Each year we assemble beautiful crafts and jewelry from the nation’s finest artisans. This year we have added many more handmade one of a kind crafts both functional and decorative in all price ranges. We have hand made items from fancy gift cards and hand crafted ornaments for those inexpensive yet unique gifts for special people. There is blown glass, handmade dolls and books, pottery, unique Christmas ornaments, jewelry and much more. It is a fabulous place to get all your holiday shopping done and everything in the gallery is hand made in the United States.